February | 2014 | Careerschap | The musings of a careers professional in the higher education sector. Paradigm Shifts & Careers Guidance: It’s life Jim but not as we know it. It’s a common misconception amongst sci-fi fans & Trekkies that Kirk says to his Chief Engineer, “Beam me up Scotty”. Despite its place and use in popular culture those immortal words were never once ushered in any of the series or films. Another one is the aforementioned title of this blog entry, where Spock is supposed to have said “It’s life Jim but not as we know it”. Guess what? That widely quoted line wasn’t said either. Probably the most famous one is the overly misquoted passage from Star Wars, you know the one, “Luke, I am your father”. But the actual quote is: “No, I am your father”. Mind blowing isn’t it! The purpose of this isn’t to thrust upon you my encyclopaedic knowledge of sci-fi related misquotes (it’s not really encyclopaedic, more like postage stamped sized) but to introduce a monumentally sized tenuous link between the feeling you get from suddenly realising you’ve been misquoting Darth Vader for the last 20 odd years and the changed mind-set that may then result which we could call a paradigm shift moment. It is easy to understand how life events can exert a paradigm shift in our thinking and behaviour that then changes our approach and path through our careers. For higher education students it could be a week’s work placement or single employer visit that changes an outlook or predisposed feeling on a particular job from an unlikely to a definite career path. It could easily be a near death experience like illness or accident that changes an individual’s value system from “living to work” to “working to live”, causing a complete career shift to achieve better work/life balance. Whilst in work, it could be a single incident that suddenly makes you think “I’m in the wrong job” I need to move on. These are events that most of us can relate to but not always be so sure of how to handle for the best. Structuralism: i.e. Labour market influences. Matching theory: i.e. Skills and personality analysis and mapping for matching self to jobs. Developmentalism: i.e. Experiential learning and activities encouraging gradual change and personal growth through stages. Constuctivist/Narrative: i.e. Talking about values and meaning. Understanding the client story. What I haven’t found much – if anything – on is recognition of how events and actions in our lives can create sudden and unexpected paradigm shifts of thought that consequentially alter the direction of our careers. These are naturally occurring events but how do we manage them – if indeed we can – and navigate through? 1) Motivational epiphany: Acute sense of realisation and self-awareness as a catalyst for wanting to instigate change. 2) Momentary paralysis: Debilitating sense of realisation causing cognitive dissonance and inaction. Perhaps part of the answer lies in aspects of transition theory. There is Schlossberg’s Transition Theory around unanticipated transitions and the use of the four S’s. Particularly around support available and coping strategies. It is possible to see the role of Careers Advisers in this process as A) We can be part of a wider support network as well as identifying other helpers and B) Assisting with a strategy i.e. goal setting and action planning. There is an emphasis here as viewing a paradigm shift as something that needs to be coped with on an emotional level. It is possible to see potential conflict in terms of personal capability within our roles. Are we or should we be Career Counsellors or Career Coaches or both? Additionally, rather than what we can or should be, what do we want to be? For instance counselling is highly specialised and professionally rigorous and I (personally) have always taken the approach of keeping and viewing my practice in a more coaching capacity. We should also consider how the guidance process itself can not only support individuals through their paradigm shift but also be a creator of them. When this occurs (with the caveat of how do we always know it has happened) do we then have an obligation and responsibility to support the client in a series of meetings rather than just wave them off with a “be on your way, my work is done” approach. I’m sure no one would take the latter stance but my worry is that careers guidance interviews can create a fertile environment for paradigm shifts but not always set in place continuing support. Let’s face it, we aren’t dealing with something tangible that is always instantly recognised and fed back to us. So I’m throwing this one out there and would love to hear people’s thoughts on our role as catalysts and coping mechanisms for paradigm shifts. If nothing else you will have learned how to stop Kirk, Spock and Darth Vader being misquoted. May the careers force be with you. Logos, Pathos, Ethos: Three words that can transform your career. When I attended a guest speaker session this week which was organised by the School of Law at the university where I work I wasn’t sure what to expect. All I knew was that it had a central theme of how to present with confidence and clarity. It sounded interesting and worthwhile and in truth I was hoping to pick up some tips myself as I often find I am speaking in lecture halls to 80+ students, which needless to say, you have to hold your nerve! It is also easy to understand how relevant and important personal presentation is within the field of law (think representing defendants in court, presenting to business clients, etc). For aspiring solicitors and barristers they need to be able to perform in moots amongst their peers, present their work and of course eventually pitch their skills to employers. But public speaking isn’t just for select job roles. With students paying a premium for their degree there is a shifting emphasis on graduate level outcomes with employability high on the agenda for HE institutions as a whole. (As an aside and related, my colleague Tom Staunton wrote a nice piece about how “communicating value” is a key attribute of the Employable Graduate Framework). So public speaking, as far as I can see, isn’t given much priority across education as a whole. In truth, how many of us when we were in school, FE or even HE remember having some form of specialist training on how to effectively get our message across? It’s not like there is a core module that deals with this on every undergraduate course. We tell students they need to research before interviews and instruct how to deliver excellent answers but what about how that answer is delivered? I suspect not much. I had this very same conversation with our presenter, Maggie Ford, who agreed that it was somewhat perplexing that this hugely important skill is often neglected with students usually learning though trial and error through their studies in the hope they get better as they go along. To give you some background, Maggie is a RADA trained theatre/screen director, actress and voice coach with many years experience working with high profile personal and corporate clients. In other words she knows her stuff. We had around 35 law students in the room and Maggie got everyone standing up performing breathing exercises. This was paired up with vocal exercises that caused murmurs and pockets of embarrassed laughter. All this was part of a warm up working towards the mantra that the “body relaxes the mind”. I had to agree. Once warm ups were complete we were introduced to some essential issues around public speaking. Namely, logos, pathos and ethos. Yes, these are the three musketeers of the vocal performance world. We need all three of these in our performance when speaking in public. Let me explain. Logos – is the logic and reasoning of what you are saying, your content. Let’s hope it makes sense. Pathos – Is the emotion that is conveyed to the audience. Don’t be monotone. Ethos – Is your credibility, making the story personal to you. A brilliant example of this in action was given. Imagine reading a 5 year old a story. Hopefully your approach would be to try and make it sound interesting with your voice. When I thought of how I read to my son I understood instantly what I should be trying to achieve in my presenting. I needed to tell a story. More great advice was how to start off your public speaking: Breathe, make eye contact, smile and begin. I left the session with a feeling of having learned some vital skills. I also left wishing I had attended a session like this 15 years sooner. Better late than never. Mind Mapping for Career Exploration and Research using the four Rs. Mind maps are nothing new, although the term is relatively recent – well the 1970s as popularised by Tony Buzan – the concept goes back much further. For the uninitiated mind maps are a way of drawing your thoughts in a non-linear way through the use of radial branches emanating from a central theme or idea. Mind maps can be used for various reasons such as idea generation, problem solving, decision making, organising notes etc. I’m sure there are many more reasons out there but those are the main ones I can think of for now. Many people enjoy or benefit from visual thinking and learning and use mind maps as a way of expressing and recording. I’ve personally used mind maps before for a whole host of reasons but particularly in the use of brainstorming for ideas or researching particular careers. For me, the process is as important as the outcome, especially in the way that drawing by hand, as ideas flow, then becomes a really powerful product of visual thinking. I also like the way it records how ideas have progressed and demonstrates those thought processes. I’ve experimented with mind mapping with regards to career exploration and research with clients in the past and have usually received positive feedback. It’s been especially useful when clients have gone through the process and have then brought back and explained the results in a follow up appointment. 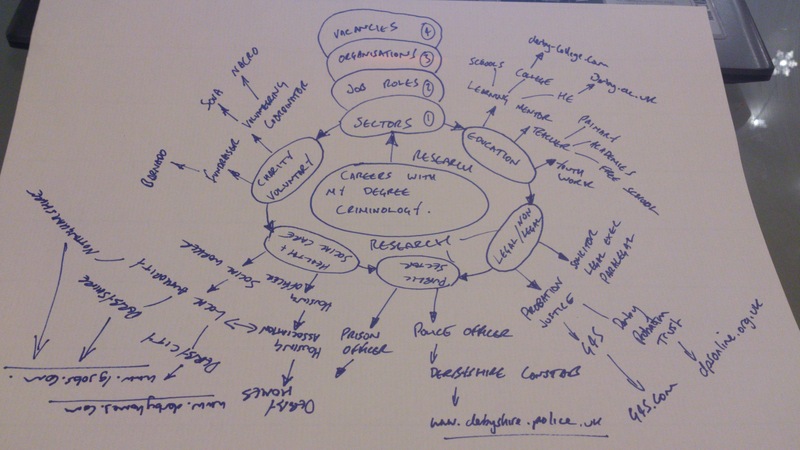 Mind Maps have normally worked well when I’ve faced questions such as, “I don’t know what I can do with my degree?” or “I’ve thought about the obvious careers that tutors have told me about but I want to see what else is out there that is similar?”. I’ve included a picture of one way I have got clients to approach this as a basic exercise. You can use an A3 piece of paper with coloured pens (preferable) or whatever is to hand like in my drawing using a felt pen and some A4 paper. My Career Mind Map example with rather poor drawing ability! For a first attempt we’d normally do this together. Now for an example, let’s say we have a student studying criminology who is looking to see what they can do with their degree when they graduate. They have some ideas about possibly working for the police or within the probation service but nothing firm. Firstly, we’d start off with their degree in the middle of the page. At this stage we are trying to develop some occupational awareness of what may be out there. The first set of branches may look at job sectors that may be relevant or of interest. This is where the client begins to do some basic research using the internet. They may find, as they want to help people overcome barriers and achieve their potential that education, charity/voluntary, legal/non legal, public sector, health & social care all look like sectors of initial interest and worthy of pursuit. At this stage we are really broad but through some basic internet research the student has provided some initial focus and convergence. Note: There is a stop/start nature to doing it this way going something like ruminate/research/refine/record, hence my using the four Rs title! Next they may look for job roles that may be of interest within these sectors and again do some basic research. So for instance in education they may have “Learning Mentor”, in legal they may have “Solicitor”, in charity “Volunteering Coordinator”, in health & social care they may have “Family Support Worker. Obviously being a mind map there is no limit to what they could find and include. To use a metaphor all the student is doing is following the rabbit down the hole and seeing where it takes them. After looking at job roles, the branches may then radiate to specific organisations so the student can look at vacancy information to check job descriptions, salary, number of vacancies, entry requirements etc. My role – if the student hasn’t considered or completed a mind map before – is to demonstrate and guide them into how and where they can begin to find the answers that the mind mapping process may generate. For example a student may ask where can they find out more on certain job roles? Or what are the best vacancy websites for particular jobs? We all have to start somewhere with our career planning. Mind maps won’t generate all the answers needed or wanted but they can be a useful tool for practitioners and their clients to use to begin to make the unconscious into conscious. It would be great to hear some thoughts from people who have used mind mapping as part of the career planning process. I’ve included a link to a YouTube video of mind mapping. It took me a while to find one that was authentic looking and didn’t promote some version of mind mapping software. It’s not related to careers but it does at least show the process in action so please take a look. I’ve just read a brief but thought provoking article in the Guardian careers section called “From zero to hero: five down-and-out jobseeker success stories“. What really comes to the fore in each of the five stories are the roles of resilience & persistence to setbacks in pursuing a chosen career and then ultimately achieving success. Now our protagonists ultimately proved their worth and talent to a wider audience thereby validating their chosen path. What becomes less certain is what would have happened without one or both of those crucial attributes. Let me explain. Without persistence J K Rowling may have given up at the 12th publisher rather than the crucial 13th that proved the making of her. Without resilience she may have let the first couple of setbacks affect her emotionally and doubt the quality of her work which to the horror of all muggles out there may have meant in a parallel universe that Harry Potter does not exist at all! There is a causality and interplay between the two attributes that is interesting and important but not always appreciated. I believe the interplay can produce different outcomes for different people. Consider – if you can bare it – the case of a wannabe pop star on one of those ubiquitous “talent” shows. Imagine a person who has a strong voice but for reasons other than their vocals – let’s say their attitude – messrs Walsh & Cowell say no thanks. Now, imagine if that person is resilient to the outcome. They decide to work on their “attitude”, however that is supposed to work and not let the feedback mean there was an absoluteness to the opinion that they couldn’t make it. So next year they are back (having worked on having the correct attitude) and put themselves through the same arduous and potentially devastating process again. Now, coming back again to audition in my book demonstrates persistence but in this case required some initial resilience to the first setback. It is easy to see why we need resilience to facilitate our belief that persisting may be worthwhile even when producing the same action (in J K Rowlings case submitting the same book) proves fruitless. Where it gets more interesting is can it work the other way around? Persistence as a precursor to resilience. Philosophy lends a hand here as Nietzsche’s original line from life’s school of war suggested “what does not kill me makes me stronger” (which i’m sure is referenced or paraphrased heavily in popular musical lyrics in keeping with my talent show example). So is it possible the very actions associated with being persistent with something can generate and impart on you resilience to future outcomes? That somehow the collective effort in repeating and persisting can generate some sort of value or threshold that is consciously recognised and should not be wasted by giving up? I like to believe it can. How many times have you said to yourself “I’ve come this far, so I’m not giving up now”. These are just my thoughts. Now I’m off to find a chicken and egg.